Happiness is … was the theme for a whole week of term at my son’s school. *POST CONTAINS AFFILIATE LINKS* They were doing Thai chi every morning, learning about healthy eating options, making smoothies, dancing, singing and generally exploring what makes them happy. It got me thinking… What makes me truly happy and if asked to describe what happiness is for me would I be able to? What did the boys say? The box includes going on holiday, swimming, playing minecraft (much to my disgust! ), having a cuddly with mummy (good choice boys!) and playing bundles with daddy (mummy finds this very loud game hugely annoying, but still). They also brought home some of their in class work and I wanted to share what my year one little one had written in his book about happiness. I think this was a collaborative year one expression as he doesn’t even like strawberries, but still it is cute. Children are generally happy aren’t they? My kids of course throw tantrums and are unhappy when they don’t get their own way or don’t sleep for long enough (we are all unhappy then), but for the most part kids are just happy and it is only little things that make them happy most of the time. Today my girls have spent all afternoon playing with playdoh and some toy fairies in their My Fairy Garden. They are making up little conversations and are so happy doing it. As an adult and particularly as a busy parent I think we miss those little things a lot of the time. We are so busy rushing around and doing that we don’t just look around and enjoy the now. I know I am guilty of this and whole weeks go by in a blur of doing things that have to be done. It all comes back to that concept of self care. The kids theme week made me think about this more and so I set myself a challenge to see think about things that made me happy. I decided to set aside a few minutes everyday and find something that summed up what happiness is for me. I wanted to really be mindful about it and think about what happiness is for me. You can see the results over on instagram and I even got some others to join in and share their happiness too. Doing this everyday for a week did actually make me feel uplifted and a bit more grounded in being positive so I started the day from a good place. This doesn’t mean that things didn’t still get to me as of course there was still all of the day to day chaos to deal with. I also really hurt my neck half way through the week and so was feeling quite sorry for myself at points, but I still found it lifted my day by the little things or memories making me smile. Jo said creating things makes me happy. Sewing, embroidering, cooking, arts and crafts. The end product doesn’t even need to be perfect to just enjoy the time mindfully spent making it! She has some great sewing ideas over on a rose tinted world. Jenny from Midwife and Life is a girl after my own heart on the happiness is front. She is happy when watching Ru Paul’s drag race and eating crisps. Alone. Christy who writes as Welsh Mum of One loves cooking a meal that turns out perfect. Her happiness is watching her family sitting around the dinner table smiling and chatting (instead of having a tantrum and throwing food on the floor – we have a toddler!). She says it makes me so happy! I gain a lot of happiness from cooking and socialising over food. Firstly, I need Christy’s secret as mealtimes here are typically bedlam!! Secondly I must watch drag race and I wish I could sew. Right I am off for a cup of tea and to read a book in a mo! I started this happiness is quest to really work out what makes me happy. The good news is that there is plenty in my life that brings me joy. Now all I have to do is remember to take stock once in a while. I guess the long and short of it is I am realising more and more that I need to slow down and look around. If I don’t I am going to miss some precious moments. 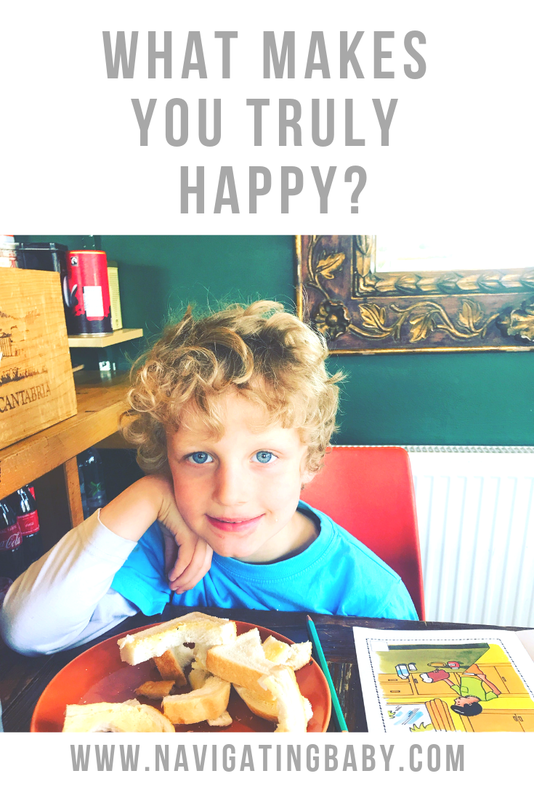 What came out of the instagram #myhappinessis challenge, the bloggers and through watching my children is that happiness is different for everyone. It is often the little things that bring the most joy so we need to stop and be mindful about happiness.